Food or product drives are a favourite fundraiser among clubs as they have an incredible track record at raising solid fundraising dollars. Popular choices are chocolate frogs or bars, lollies, cookie dough, sunscreen, pottery, plants, lamingtons. This is a fundraiser that involves everyone at the club pitching in and selling some chocolates, lollies or items on your club’s behalf. It is important to understand that not all families will have people they can sell their items to and these members may need to be offered another way to help out to ensure they still feel included and like they are helping the club. This could be through collating the money, ordering the items and distributing the boxes to club members. These kind of drives can be very successful as the people giving money to your club are getting something tangible and often tasty in return and this makes for a fairly easy sell of your products. Another reason these drives are so successful is that the work is spread among the volunteers at your club and there is generally not an overwhelming amount of organising involved, as would be seen at a large event. Some consideration might be given to keeping your sellers motivated such as prizes for selling the highest amount of boxes. Why a Food or Product Drive? 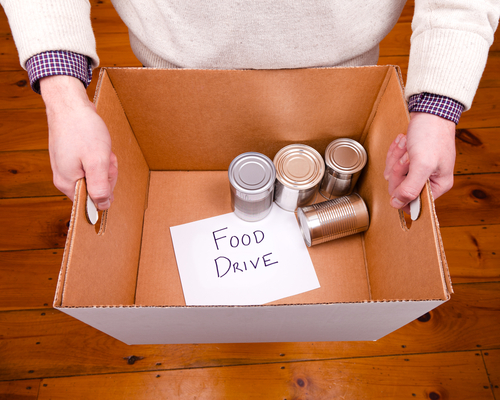 A food or product drive is a fairly easy fundraiser to run as a great deal of the work is completed by an external provider. It is also low cost to run and there is very little risk in terms of losing money for your club. Another awesome reason to have a food or product drive is that the target audience for this fundraiser is the families, friends, work colleagues and neighbours of sports club members. This takes pressure off current members and supporters to be constantly donating to the club. This can be run at any time of the year but best when the club is busy and members are in and out of the club often. This helps with motivation to sell more boxes and also means that dropping off money and picking up new boxes is quick and simple. Decide a dates of your food or product drive. Decide on the provider and what your club will sell. Set clear expectations for your club members and volunteers and offer support to find ways to sell their boxes. Organise any competitions that will be used to help motivate members and supporters to sell more boxes. Distribute the food or products. Communicate with your members and supporters selling boxes and keep them updated on how the sales are going. Encourage more sales, this may be through a competition. Distribute and order more boxes as necessary. Collect and collate money as it comes in, ensure this is in a safe and secure location. Count the final funds raised. Return unsold food or product to the company. Collate and distribute the boxes. Collate the money and store it safely throughout the drive. Most importantly – SELL lots of boxes! You could also approach current club Sponsors for any prizes you plan to use if you are running a motivational competition. You may like to consider using technology to reduce the workload on your volunteers and increase your fundraising dollars. Your club may like to use social media, email newsletters and your club website to promote the event. You may also like to live stream the leaders who have sold the highest amount of boxes picking up their next lot of boxes to help build friendly competition and to raise awareness for what you are selling. Potential profit for your food or product drive will be driven by your club’s attention to detail in collecting the money and marketing. A conservative estimate would be to base projected revenue on one box per family. It is anticipated that although some families may not sell a box, others will sell more than one. There are generally no upfront costs as fundraising food or products can usually be purchased on credit. If credit is not undertaken the items will need to be paid for in advance. Costs are then limited to any advertising your club chooses to do such as creating and printing flyers. It is recommended the food or products be distributed and money collected at team meetings to reduce the need for special delivery trips. You may like to use social media and club newsletters to remind members and supporters to sell their boxes and also to build excitement, motivation and perhaps competition to get people selling as many boxes as they can! As we know obesity is an issue in today’s society and one we need to consider being mindful of. If this is a concern for your club what you choose to sell will need to be discussed and decided upon. your club may choose a healthier option available. To ensure high sales, consider selling popular options from a well known brand. You might also like to set up a competition within your club to keep your members and supporters motivated. There are obvious financial risks if enough food or products aren’t sold or fundraising dollars made to cover the cost of the outlay for the items if these were not purchased through credit. When food is involved ensure they are clearly labeled with ingredients. Allergies can be life threatening and need to be considered seriously. This should be taken care of by your supplier but it is always worth checking! Council or local statutory authority approval may be required to ensure compliance with food safety regulations. We recommend you check with your local council. It is also important to contact your insurance company to ensure your public liability insurance policies covers your fundraiser. Offering prizes to those who sell the most boxes is a great way to motivate club members. This results in some members selling many boxes, which negates the effect of some members not selling any. Clubs can also encourage members to start selling as soon as possible by offering all those who sell a box in the first week entry to an early bird raffle. Posting updates on leading sellers in the club’s social media is a also a great encouragement technique. All of your members will need to take part in the fundraising to ensure it is successful. There will also be a small number of volunteers needed for distribution and collection of the food or products, promoting event and managing finances. Club members need to be aware when and where they are to collect the food or products. Your club will need to ensure there is someone, or a small group of people in charge of receiving, storing, distributing and collecting the food or products and money. For simplicity, it is preferable that all food or products and money is collected on one day. If the club has Saturday tournaments for instance, this would be a good day to collect. A person or persons needs to be appointed responsible for collecting, reconciling and storing cash collected during the fundraiser. This person(s) would also be responsible for following up with members who have not yet returned either food/products or funds to ensure that the club is not out of pocket when it comes time to pay for the items. It may be a good idea for your club to consider different options including vegetarian, vegan, gluten free or dairy free depending on those who are attending your night.